Medicom Toys teamed up with Japanese designers Ground Y and Yasuto Sasada for another take on the psychedelic Bearbrick set. Black & white colors and complicated design patterns for which the artist is known for has been successfully brought to the Beabrrick platform. 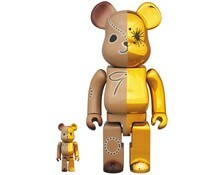 The 400% & 100% Bearbrick set by Ground Y x Yasuto Sasada is a limited edition.